Welcome to my full Swagbucks review! By the end, you should have a pretty good idea as to whether or not Swagbucks is right for you. If you have any questions after reading through this review, feel free to place a comment below and I’ll get back to you shortly. Swagbucks is a website that pays you to search the web, complete surveys, do various tasks, and more. Swagbucks is one of the most well-known and popular GPT (Get Paid To) websites, and has been around since 2008. As you’ve probably seen already, there are a lot of Swagbucks reviews out there. Most claim it’s a legit site and not a scam, but let’s dive into exactly how it works, and my experience using it. Owners: Scott Dudelson, Josef Gorowitz, Ron Leshem and Eron Zehavi. Swagbucks pays you for completing certain activities on their website (I’ll describe these below), and for using their search engine. You won’t be able to replace your income with Swagbucks, but it can be a good way to make an extra couple hundred a year for a few minutes of work each day. 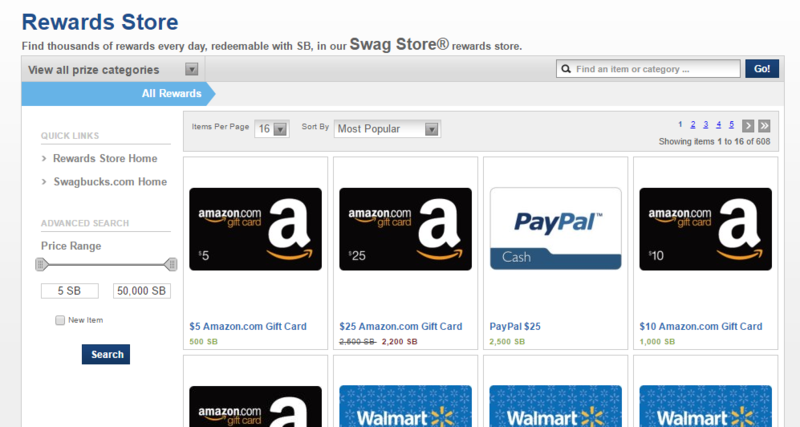 The Swagbucks “currency” is fittingly named “swag bucks”, or “SB” for short. 1 SB is worth $0.01 (a penny). Signing up for Swagbucks is easy – all you need is an email and a password. You’ll also be asked a security question (such as “what’s your favorite hobby?”), to help protect against others hacking into your account. Click here to sign up. 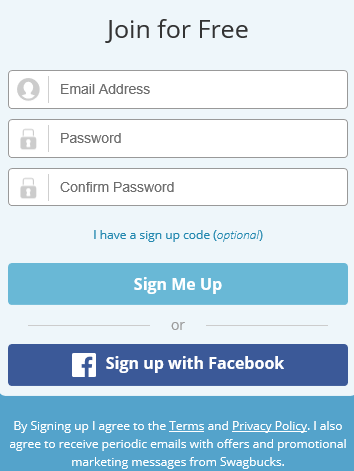 There’s also the option to sign up with your Facebook account. The word “scam” implies something that takes your money; a fraud. I have been using Swagbucks for about a year and half now with no problems. Swagbucks does not cost anything, in fact, quite the opposite: it pays YOU! So, since Swagbucks can’t take your money, what about your private information? This is definitely a concern, as you do have to give some personal information when doing surveys and offers. But your information is pooled with millions of other people’s information, and it’s only used for research purposes. If this is a concern for you, there are ways to make money from Swagbucks that don’t require giving out your personal information. By using the Swagbucks search engine, you can actually earn money while browsing the web. Swagbucks’ search engine is powered by Yahoo, so the results you’ll get will be more or less the same as you get with Google, Bing, or any other search engine for that matter. While surfing the web, Swagbucks will occasionally reward you a random amount of SB. The rewards are very random, but if you do a lot of searching you’ll get a few SB rewards per day. The rewards start as low as 4 SB, but some users have reported earning up to 100 SB for one search. On average, however, 6-10 SB is pretty standard. The highest I’ve earned with one search was 30 SB. Well, count me into the “earned 100 SB for one search” club! That was probably the easiest dollar I’ve ever made. 😉 In fact, I wrote a post about it which you can check out here. Taking surveys is one of the fastest and easiest ways to earn SB. The payout is pretty bad for most surveys, but every now and then you’ll see a 5-minute survey offering a payout of 100 or more swag bucks. Unfortunately, like most survey sites, you will disqualify from a lot of the surveys you attempt. One user on Reddit reported (with proof) making just over 1,000 swag bucks in one day just by doing surveys. I wouldn’t recommend trying this yourself unless you NEED $10 right now, because it would take almost all day. And you’d probably disqualify from half the surveys anyway. Nonetheless, it’s an interesting stat and if you could do that every day for a year, you’d wind up making $3,650. Swagbucks has a list of offers that when completed, can each earn you several dollars. Completing offers is easily the fastest way to earn a bunch of swag bucks. However, most of the offers require you to sign up for a free trial which you’ll have to remember to cancel, and others you actually have to pay for. Some of them will send you a ton of spam emails as well. Unless you’re genuinely interested in these offers, I would not suggest doing them (here’s why). 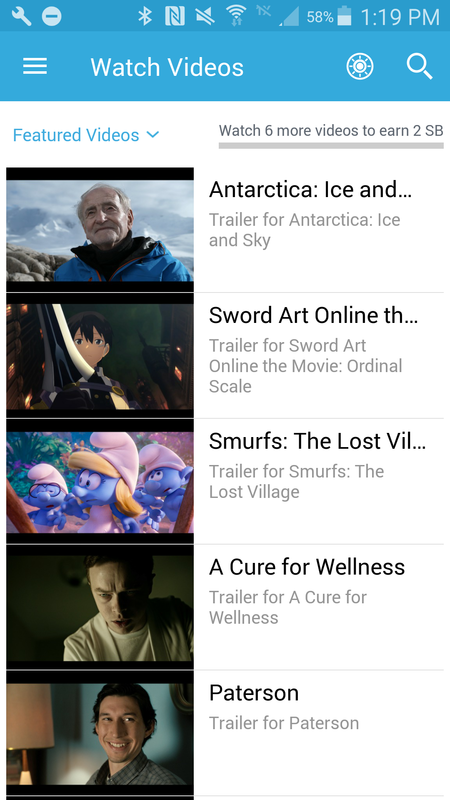 Although watching videos won’t earn you very many swag bucks, (something like 1-2 SB for every 6 videos), most of the videos are about trending topics which a lot of people will watch anyway. So why not get paid for it? Some people like to let the videos run while doing other things, so they don’t have to waste their time watching for a long while only to earn a few cents. That way it’s essentially passive income, and can earn you a dollar or two per day. Keep in mind that you’ll have to regularly click on the next playlist to watch, after the one before it finishes – so it’s not 100% passive. A fun way to earn some extra SB is by playing games. There are lots of games to choose from, but most of them seem to be slots-related. 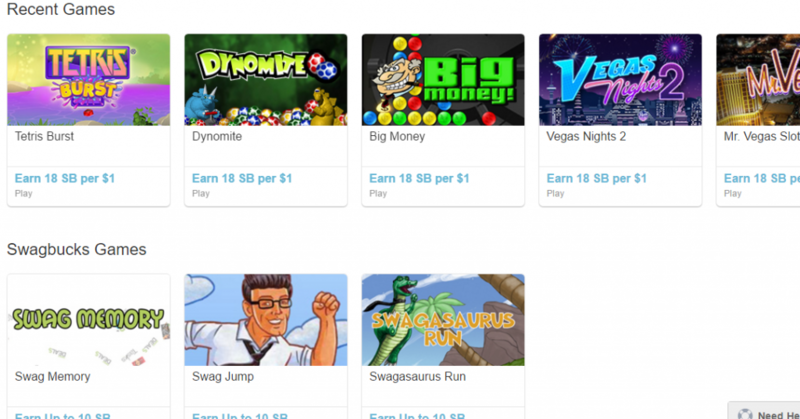 You can earn 18 swag bucks for every $1 you spend on in-game purchases, or by playing Swagbucks’ own games, you can earn a couple SB now and then without having to spend anything. I played one of their games four times, and twice I earned 2 SB for a total of 4 SB. It only took a couple minutes, and the game was actually pretty fun. One of the best ways to earn swag bucks is to get cash back for shopping online. If you plan to purchase something online, make sure to go to the store through Swagbucks in order to get cash back. Almost every major online retailer gives cash back in the form of swag bucks, including Amazon and eBay. Some offer as low as 1 SB per dollar, while others offer up to 50 SB per dollar. Savvy shoppers have saved a TON of money by doing this. Every day, Swagbucks posts a poll for its users. Answering it only takes a second or two, and you’ll be rewarded with 1 SB. That’s $3.65 every year just for answering a poll each day! Swagbucks has hundreds of coupons available for all kinds of groceries. For example, there’s currently a coupon for $2 off any two Pepsi Cola 12oz 12pk cans, and a coupon for 50 cents off any Windex product. Each coupon you redeem at your local grocery store will not only save you money, but also earn you 10 SB! A couple times throughout the day, Swagbucks will post “Swagcodes” on their social media profiles and on their blog. Each code will earn you a small amount (usually 2-3 SB) when you redeem them in the Swagcode box on the Swagbucks website or search engine. Every once in a while, there will be a “Swagcode Extravaganza”, where Swagbucks will post a bunch of high value Swagcodes in a single day. On these days, it’s possible to earn 20-30 SB just from Swagcodes alone! Available for free on both Android and iOS devices, the Swagbucks app offers the same sort of things that their website offers, but you can also earn an additional 50 SB per day for watching videos on the app. The videos can be run in the background, so it’s virtually passive income. Swagbucks has many sweepstakes or “Swagstakes” posted at any given time, and anyone can join them. You have to pay a certain amount of SB to join, but if you’re randomly chosen as the winner, you can earn it back and then some. I’m not the type to participate in these kinds of things, but I did try one that had a prize of 50 SB and cost 2 SB to join. No, I didn’t win. What did you expect? The Swagstakes definitely are legitimate, and plenty of people have been lucky with them. But it’s like that with any lottery. My advice is to stick with the more dependable ways of earning SB. A great way to earn some consistent swag bucks is by getting referrals. You make 10% of all the earnings your referral makes, so if they make 500 SB, you’d make 50 SB. Also, once your referral reaches 300 SB, you both get an extra $3 (300 SB). If you take a lot of surveys, do all your browsing through the Swagbucks search engine, and are actively utilizing Swagbucks’ features, you can expect to earn a pretty decent amount from Swagbucks. Probably in the range of several hundred a year, but it really depends on how active you are. I almost exclusively earn swag bucks through their search engine, and have already earned well over $20 in passive income. That’s equal to 56,095 swag bucks per year, or $560.95! That’s enough to pay for a nice brand-new computer, or Christmas for an entire family. As you can see, taking surveys and playing videos on the mobile app are easily the most lucrative ways to make money with Swagbucks. But even if you only use the search engine feature, that’s still $26 per year. Not bad, considering it requires no extra work on your part. There are many ways to redeem your SB. The most common way is to redeem them for gift cards. There are a vast number of gift cards available, including all the big names such as Amazon, eBay and iTunes. You can redeem gift cards for as low as 300 SB, and up to 50,000 SB. You can also redeem SB for PayPal cash once you have 2,500 SB. You also have the option to donate your SB to a charity of your choice. Yes, you need at least 300 SB to redeem certain gift cards. If you want PayPal cash, you’ll need at least $25 worth of SB before you can cash out your earnings. So, although it’s quite easy to rack up 300 SB, Swagbucks won’t be the answer if you need cash RIGHT NOW. Qmee would be the better option in that situation, since it has no minimum cash out amount. This is true, but the thing is, Swagbucks isn’t supposed to earn you a full-time income. Also, if you just use the search engine and don’t waste your time taking surveys, you can actually make some decent passive income each month for just browsing the web. Take advantage of the passive income opportunities Swagbucks presents, and you won’t be disappointed. Some people are having trouble getting SB for offers they completed. Although this is unfortunate, it’s just another reason to stay away from the offers (like I said earlier). Unless you are genuinely interested in an offer, I advise that you ignore it altogether. Almost all survey sites pose this risk, and Swagbucks is no exception. However, if you want to reduce the chance of this happening, be sure to fully fill out your “survey profile”. I actually found the Swagbucks surveys to be more reliable than, say, Qmee’s surveys, since I was actually able to successfully complete a couple of them (out of like 5 attempts). When people send in support tickets, customer service rarely gets back in a timely manner. Sadly, most similar companies have this same annoying problem. Swagbucks has been around since 2008, and throughout this time has maintained good reputation. You aren’t guaranteed to qualify for every survey – in fact, you’ll probably only qualify for a small percentage of the ones you attempt. Final Thoughts – Scam or Legit? Swagbucks is not a scam. It’s a legitimate way to earn money online. By just using their search engine, you can make some decent pocket change each month. If you’re an active user, take surveys, complete offers, and use the site to its full potential, you can make a modest side income. I haven’t experienced any issues with Swagbucks except for disqualifying from most of the surveys I tried, but that’s normal with any survey site. In my opinion, Swagbucks offers some excellent ways to earn a little extra each month, and can even pay for Christmas if you utilize everything it has to offer. While Swagbucks is a nice way to earn a little extra pocket change, it certainly won’t make you a full-time income like some online ventures. The amount of money you can make is virtually unlimited – some people make millions per year! Since affiliate marketing is a real business, you won’t make money right away (like you can with Swagbucks). But if you put forth a serious effort, you will start to see your earnings grow, and possibly be making enough to quit your job. It takes time, yes, but trust me: it’s well worth it. Have you ever used Swagbucks before? What do you think of it? Feel free to leave a comment below, and if you have any questions, I’d love to help out! Taking your numbers above and expanding on your maths: Assuming and average of 35 minutes per week typing searches, five minutes per video, 10 minutes per week finding and printing coupons, 2 minutes to load and complete polls, an average of 20 minutes per day for one survey, 10 minutes a day to play games and one hour per year to setup and send referrals…. earned you 78,500 SB for the year, which means you were effectively paid 36SB an hour or $0.36 per hour…. Very valid point. 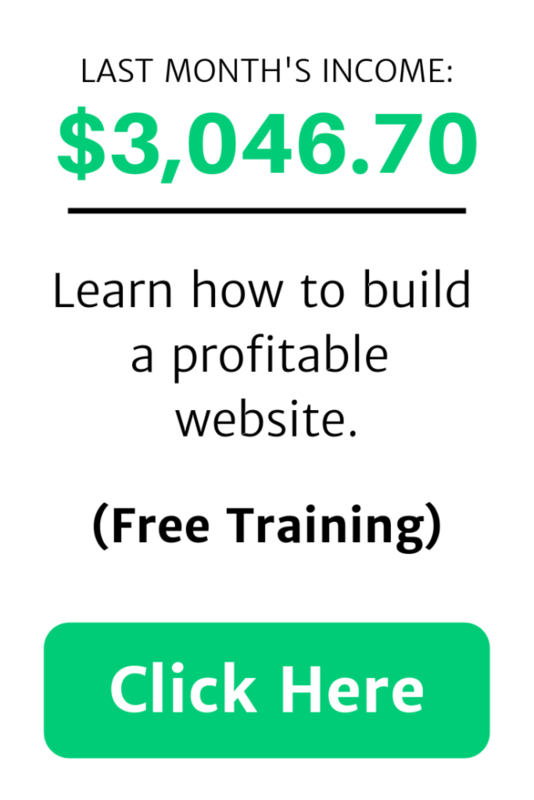 And that’s why I suggest if people really want to make money online, they pursue something like this which can replace any income in a few years. However, for those who don’t feel they have the time to start an online business, Swagbucks can be helpful and cover small costs. The time is difficult to justify though as you imply. Why do they need my PayPal password to redeem $25. No one should ask for a password! Are you sure it’s not PayPal asking for your password in order to log in? I know with PayPal, oftentimes it will be a popup over the other website, which can make it look as if it’s the website, not PayPal, asking for your password. When it comes to using Swagbucks, I try to stick to taking the surveys versus doing the offers. I definitely think that it is doable to make at least $3-5 a day if you keep up with it for sure! Please take the time and review the hundreds of complaints regarding Swagbucks practices. They do not credit your account unless you file a complaint and then you may never see your rewards. Something is seriously wrong with this site and I may never see the $60 PayPal payment that is owed me. I have never experienced this. Can you provide more details about your case? How do you uninstall this annoying product? If you are using Chrome, you can delete the extension by right clicking it and selecting “Remove from Chrome…”. If you are using a different browser, you’ll want to do a quick search on how to remove extensions on the browser you’re using. If you set Swagbucks as your default browser and would like to revert to a different browser, you should find the option to do so in your browser settings. That’s a very thorough review on Swagbucks and you have really covered all bases. I strongly believe your article will help people in their decision making. Thanks for the useful information I will come back to your website to learn more information. Keep up the great work. Wishing you great success! True a scam is someone who takes your money without a return. Swagbucks has a tracking problem. I completed 2 charity SB offers. Never got my SBs. They wanted screenshots. Isn’t tracking sufficient? Sounds like a scam to me. Some offers require specific steps (such as screenshot proof) that others may not, so you just have to be prepare to complete each step. It can be quite a hassle sometimes. I’ve just stopped doing offers, and don’t recommend them as a good way to earn money on a ‘get paid to’ type of site like Swagbucks. Article says “1 SB is worth $0.01 (a penny)”. I believe 1 SB is worth $1.00 one dollar. I just went to Swagbucks to double check. It appears that 1 SB actually is worth one cent, and this can be confirmed when you visit the Rewards Store. For example, in order to claim a $5 Amazon gift card, you need 500 SB, and in order to cash out $25 to PayPal, you need 2500 SB.